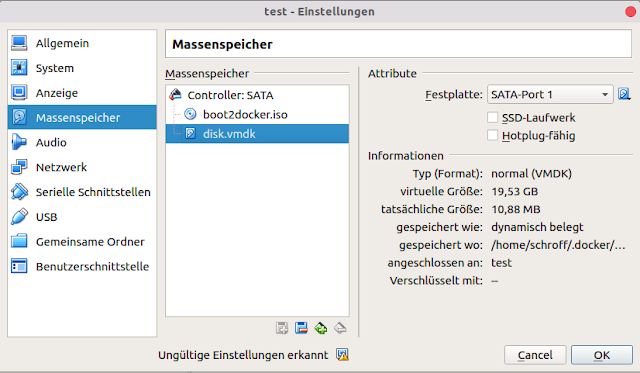 After doing some first steps with docker, i wanted to test docker-swarm. Because of the limited resources of my notebook, i was looking for a Linux with a minimal footprint. In the context of setting up VMs for docker-swarm i found a log of articles about doing that with the tool docker-machine. It sounds like this tool can create VMs just with one command. (here the documentation). (test) Found a new host-only adapter: "vboxnet0"
After this command inside my virtualbox a new machine shows up with 1GB RAM, 20 GB HDD (dynamic allocated), 2 network adapters (1x NAT, 1x host only). 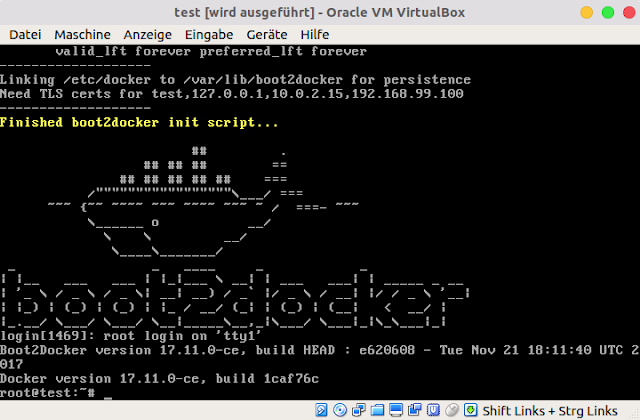 Nevertheless docker-machine is an excellent tool. If you are interested in creating a swarm, read this tutorial. The homepage of the OS boot2docker can be found here.